About five years ago, Hatsun Agro Product Ltd employed 85 veterinary doctors. Today, that number stands at 40. “Vets aren’t easy to get these days. Even the ones who come rarely stick around for long,” complains R G Chandramogan, CMD of the Rs 2,500 crore Chennai-based company, India’s largest private sector dairy player. According to Sandeep Karkhanis, India Country Manager at Merial, the animal health products division of the French pharma giant Sanofi, the shortage of veterinary professionals in the country is exacerbated by an overwhelming preference for government jobs. “Their first choice is state animal husbandry departments, veterinary colleges/universities and the Indian Army’s Remount Veterinary Corps. The second is banks and insurance companies, followed by dairy cooperatives,” he says. One reason for this is that veterinary science graduates are predominantly from rural or semi-urban backgrounds. The few from urban/metro areas who opt for the subject usually end up doing niche canine or small animal veterinary practice. The Pet Practitioners Association of Mumbai, for instance, has 200-odd life members. Also, veterinary science till recently wasn’t attracting too many students — more so during the IT boom of 1990s and 2000s when procuring engineering degrees became the flavour of the day. But this was precisely the time organised private dairies were coming up in a big way, alongside other industries such as poultry, meat processing, animal feed, pharma and even BPO (the German insurance major Allianz has an offshore facility in Thiruvananthapuram employing veterinary graduates to process animal insurance claims worldwide). “So just when demand for veterinary professionals was growing — and not simply from animal husbandry departments — shortages began developing,” points out K M L Pathak, Deputy Director General (Animal Sciences), Indian Council of Agricultural Research. However, with IT industry salaries more or less stagnating, a general revival of interest in science education is being seen, extending to veterinary degree courses. “But the problem now is that there just aren’t enough colleges offering bachelor of veterinary science (BVSc)”, notes Pathak. India currently has 55 veterinary colleges, with an average intake capacity of 60 students each, working out to a total of 3,300 a year. The numbers of graduates annually after finishing the five-year course is even lower, at about 2,100. “At this rate, the demand can never be met. There are 63,000 registered veterinarians today, whereas the requirement is between 1.1-1.2 lakh”, estimates Umesh Chandra Sharma, president, Veterinary Council of India (VCI). The general norm is to have at least one veterinary doctor for every 5,000 animals. India’s total cattle and buffalo population was 30 crore as per the 2012 Livestock Census, translating into a requirement of 60,000 vets catering to bovines alone. These would further go up if poultry, sheep, goats, pigs and other animals are added. One way of filling the widening demand-supply gap could be through attracting private investment into veterinary education. But that isn’t easy, not the least because of the VCI’s stringent Minimum Standards of Veterinary Education. These regulations mandate every college offering BVSc degree course to have a dedicated Teaching Veterinary Clinical Complex (similar to the hospitals attached to medical colleges), an Instructional Livestock Farm Complex (with minimum 20-acres land for growing fodder and housing sufficient number of livestock/poultry) and fully-equipped anatomy, physiology and biochemistry laboratories. In addition, each college has to have at least 87 teachers at assistant, associate or full professor levels. “Fulfilling these minimum standards is difficult for any private education institution,” admits Sharma. 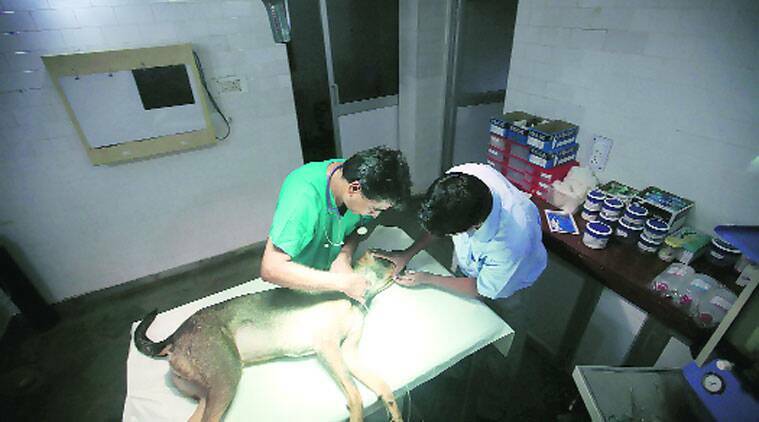 None of the existing seven private veterinary colleges — five in Rajasthan (at Jaipur, Chomu, Sikar, Bharatpur and Dungarpur) and one each in Haryana (Rohtak) and Punjab (Amritsar) — have received VCI recognition. The VCI recently, following a meeting held with the Union Agriculture Minister Radha Mohan Singh, permitted veterinary colleges “with sufficient manpower and infrastructure” to increase annual intake capacity from 60 to 100 students. But this is obviously a short-term palliative at best. “Probably, we need to have more para-veterinarians and diploma holders capable of rendering minor veterinary services under the direction and supervision of registered vets,” feels T Nanda Kumar, chairman, National Dairy Development Board. The industry, meanwhile, is learning to work with shortages. Hatsun, for example, has 285 village-level workers — mostly class X-pass — who are trained to perform artificial insemination in cows. “This job was earlier being done by vets. But today, the 40 vets I have handle only more specialised animal healthcare or preventive medicine-related tasks,” says Chandramogan.